PhD Applicants: In addition to this FAQ, please visit the PhD FAQ which has answers to questions that pertain only to doctoral programs. 01. Am I eligible to apply for your programs? MS: You are welcome to apply to USC. We will evaluate your credentials and admissibility after you have submitted an application. Here at USC, we do a comprehensive review of all applications. We do not use a formula or have minimum test score requirements for admission to USC. In general, successful applicants have demonstrated outstanding quantitative ability and proven success in previous academic endeavors, particularly in prerequisite coursework relevant to their intended major. PhD: In addition to the above, applicants must also have demonstrated research experience. 02. I do not have an undergraduate degree in engineering, math or a hard science. Can I be admitted to your program? MS & PhD: Qualified applicants will have an undergraduate degree (Bachelor of Science or equivalent) in engineering/computer science, math, physics, or another hard science such as biology or chemistry, depending on the Master’s program. Contact viterbi.gradprograms@usc.edu if you have questions about your eligibility. 03. What impact does work experience have on the application? MS & PhD: With the exception of our MS in Systems Architecting & Engineering, work experience is not required for admission and is not an application criterion. Also, work experience cannot substitute for academic coursework. However, work experience information can be included as part of the résumé/CV. 04. I have applied before. In my new application, do I have to re-submit the materials that were part of my previous application? MS & PhD: The answer to this varies depending on the circumstances. Please send an email to our Viterbi Graduate Admission Office with your full name and the USC ID number you were issued with the previous application. 05. Can I pursue my graduate engineering degree online from outside of the United States? MS: Please visit our DEN@Viterbi International Guidelines page for information. PhD: All doctoral programs are on-campus only. 06. Is conditional admission offered? MS: Conditional admission for international students is possible through the Pre-Master’s Program offered through USC’s International Academy. PhD: Doctoral programs do not offer conditional admission. 01. What are the Application Deadlines? MS: The Fall 2018 deadline is January 17, 2018, Spring 2019 deadline is September 15, 2018, and the Summer 2018 deadline is February 1, 2018. *Please note, on-campus prospective students who wish to be considered for scholarships must submit a Graduate Application for Admission and official transcripts by December 15 for the Fall semester and by August 31 for the Spring semester. Scholarships are not offered for the Summer semester. PhD: Doctoral programs only have Fall admission with an application deadline of December 15. 02. Is there a list of materials required for the application? MS: Please refer to Degree Program pages for application criteria listed by specific program. Personal Statement (Statement of Purpose) and a résumé/CV. 03. Can I apply to more than one program? MS/PhD: You may apply for a maximum of two graduate programs within the Viterbi School of Engineering with a single application fee of $90 and one set of transcripts and test scores. The Viterbi School provides this benefit primarily for students who are interested in applying for both a Master’s and a Doctoral Program, but it can be used for applying to any two Viterbi graduate programs. To apply for an additional program, a unique SECOND PROGRAM APPLICATION FEE WAIVER code must be provided by the USC Graduate Admission office and must be entered into the online application. PLEASE NOTE: Applications submitted for multiple Viterbi School programs without a valid waiver will be charged for each additional program and no refunds will be given. See Application Fee Waiver Instructions for instructions on receiving a waiver to apply for a second Viterbi School program. 04. I am having problems with the online application. Can you help me? MS & PhD: Please click on the CONTACT US link in the lower left corner of the application for assistance with: technical issues, Letters of Recommendation, application fee payment, document upload problems, etc. 05. I have not taken the GRE yet, how do I fill in the GRE section? MS & PhD: The application may be submitted with the GRE scores section left blank. It is preferable to have the application submitted earlier without the scores rather than later because you waited until your scores were available. Also, this section remains active after the application has been submitted. It is recommended that once you have your GRE scores that you log back into the application and add the scores. Please note that that your application will not be considered complete until USC has received your official GRE scores electronically from ETS. 06. What happens if all or part of my graduate application arrives after the application deadline? MS: If you decide to submit your application or supplemental materials after the deadline, please note that it will be considered late. The university will do its best to review your application but will not be able to guarantee that your file will be reviewed for the term to which you have applied. PhD: If all or part of a doctoral application will be submitted after the deadline, we recommend contacting the appropriate department PhD advisor to find out whether the department accepts late applications. 07. How and when should I expect to receive the USC ID Number? MS & PhD: After you submit the online Graduate Admission application you will receive a USC ID number via email within 5-7 business days. IMPORTANT: Because the USC ID number needs to be included with the transcript, we urge applicants to submit their application prior to the application deadline. You will need to include your USC ID with your official, sealed transcript. It should also be included in all email and correspondence with USC. If, after 10 business days you have checked your email Junk and Clutter folders and have not received a USC ID, you can request it by sending an email to viterbi.gradadmission@usc.edu with your full name, date of birth and the program to which you are applying. Note: The USC ID is not the CAS ID number. 08. How can I confirm that USC has received my materials? MS & PhD: Once you have submitted a completed application, including transcripts and test scores, please allow 4-6 weeks for USC to process your application. After that timeframe, you may send your full name and USC ID to viterbi.gradadmission@usc.edu to check on whether USC has received all of your materials. 09. How do I check my application status? MS: We are not able to provide students with information on when a specific application will be reviewed. For applications that are submitted by the application deadline, Fall admit decisions are made between January and May, and Spring decisions are made between September and early December. Please note that the date an application is submitted does not determine the date an admission decision will be issued. PhD: Doctoral applicants need to contact the appropriate department PhD advisor to check on the status of an application. 10. How can I update my Personal Statement (Statement of Purpose), CV/Résumé, transcript or add additional documents after I've submitted my application? 1) Log into your submitted application, go to the Program Materials quadrant and open the Documents tab. 2) Use one of the Other documents slots to add the updated/corrected document. 11. I made a mistake on my application, how can I have it corrected? 1) Go to the Graduate Admission Submit a Question page. 12. I don’t have TOEFL/IELTS scores yet, how do I fill in that section on the application? MS & PhD: The application may be submitted with the TOEFL/IELTS scores section left blank. It is preferable to have the application submitted earlier without the scores rather than later because you waited until your scores were available. Also, this section remains active after the application has been submitted. It is recommended that once you have your TOEFL/IELTS scores that you log back into the application and add the scores. Please note, if you are an international student your application will not be considered complete until USC has received your official TOEFL/IELTS scores electronically from the testing agency. For additional information on this requirement and the circumstances under which it can be waived, visit USC Graduate Admission’s English Proficiency page. 13. My GPA is not on a 4.0 scale, how do I fill in the GPA section on the application? MS & PhD: Please use the scale that is used by the issuing university. There is no need to convert the GPA to a 4.0 scale. 14. How and when do I submit the Financial documentation? MS: The financial documentation can be added in the Documents section of the Supporting Information quadrant of the online application. Additional submission details can be found on USC Graduate Admission’s Financial Documentation page. Note: The financial documentation must be submitted no later than April 15 for Fall admission or October 25 for Spring admission. PhD: Because USC tries to fully fund all doctoral students, applicants should not submit financial documentation. 15. Is it a problem that the name on my application and the name on my passport do not match? MS & PhD: It is not a problem. This is a common issue for international applicants. We ask that International applicants submit a copy of the first two pages of their passport. This is so that we can use the name on the passport when generating the I-20 so that the two will match. 01. Can I waive the GRE exam? MS & PhD: No, GRE scores (taken within 5 years of start of the intended semester of enrollment) are required for application to all Viterbi School graduate programs. Applicants who are enrolled in or have completed a Master’s program in the Viterbi School of Engineering. Applicants who are enrolled in or have completed PhD program in the Viterbi School of Engineering. 02. What are the required minimum GRE scores for graduate programs? MS: We do not use a formula or have minimum test score requirements for admission to USC. In general, successful applicants have demonstrated outstanding quantitative ability and proven success in previous academic endeavors, particularly prerequisite coursework relevant to their intended major. PhD: Your application will be reviewed on an individual basis so there are no minimum score requirements. However, a GPA of 3.5 or higher and strong Quantitative GRE scores are recommended to be competitive. 03. How do I submit my GRE scores to USC? MS & PhD: GRE scores must be submitted electronically from ETS. The University of Southern California’s ETS code 4852. You do not need to provide a department code. However, if the ETS system requires one, just select the one that is the best fit. All GRE scores are automatically sent to our Graduate and International Admission Office, so it doesn’t matter what department you select. Valid GRE scores must be dated within five years of the start of the intended application semester. The Fall semester starts in August, and the Spring semester starts in January. 04. Can I submit more than one set of GRE scores? MS & PhD: Yes. As long as USC receives the new scores from ETS before the application deadline, USC will use the highest scores from each test section (i.e. Quantitative, Verbal) even if that means taking scores from multiple exams. 05. I took the GRE for a previous application, can I use those scores? MS & PhD: As long as your GRE scores are dated within five years of the start of the intended application semester, they may be used. The Fall semester starts in August, and the Spring semester starts in January. Note: If you earned a previous Viterbi School graduate degree you do not need to submit GRE scores. 06. Can I submit GMAT/LSAT/MCAT scores instead of GRE scores? MS & PhD: With the exception of our Master of Construction Management (MCM) program, all Viterbi School Master’s programs require GRE scores. Our MCM program accepts either GMAT or GRE scores. 07. How do I submit transcripts to USC? MS & PhD: Full instruction how and where to submit official transcripts can be found on USC Graduate Admission’s Transcript Requirements page. 08. Can I mail my transcripts without a USC ID Number? MS & PhD: We strongly recommend including the USC ID number on your transcript to make sure it gets attached to your application. However, if you are close to the application deadline and your USC ID is not available, submitting a transcript with a mostly filled out Transcript Cover Sheet should be sufficient to have the transcript properly matched with your application. Official, sealed transcripts must be received by USC by the final application deadlines. 09. I have attended multiple institutions during my undergraduate study. Do I need to send transcripts from all institutions? MS & PhD: You must submit official transcripts from all colleges, universities, and post-secondary institutions you have previously attended, even if you did not receive a degree. 10. My previous studies were not conducted in English. Do you need academic records in the original language of instruction? MS & PhD: Yes. You need to provide both the original-language academic records and a full, word-for-word English-language translation issued by the academic institution you attended or a professional translation service. 11. How should my recommenders submit their letters? MS & PhD: Letters of Recommendation should be submitted through the online graduate application. If your recommenders are having problems with the Letters of Recommendation system, please click on the CONTACT US link in the lower left corner of the application for assistance. 12. Should I wait for all of my recommenders to send their Letters of Recommendation before I submit my application? MS & PhD: Please complete and submit the other parts of the application by the January 15 deadline even if your letters have not yet been submitted. This is separate module of the application so your recommenders will still be able to add their letters, and you will be able to check the status of letters or even add/replace a recommender after the application has been submitted. 13. Is there a length or format requirement for the Personal Statement (Statement of Purpose)? MS & PhD: There is no standardized format or length for the Personal Statement (Statement of Purpose), but we can provide some general guidelines. It should describe succinctly your reasons for applying to the proposed program at the Viterbi School of Engineering, your preparation for this field of study, study interests, future career plans, and other aspects of your background and interests which may aid the admissions committee in evaluating your aptitude and motivation for graduate study. 14. What is the format requirement for my résumé/CV? MS & PhD: There is no standardized format for the résumé/CV. 15. How can I update my Personal Statement (Statement of Purpose), CV/Résumé or add additional documents after I've submitted my application? 2) In the Program Materials quadrant, in the Documents tab you can add new/updated materials as an Other document. Note: Once an application has been submitted, updated transcripts and Personal Statements can only be added as an Other document. 16. Can I waive the TOEFL/IELTS requirement? MS & PhD: International graduate applicants must demonstrate English language proficiency by submitting either TOEFL or IELTS scores. For details on the requirement and for information on waiving the English Language requirement, visit USC Graduate Admission’s English Proficiency page. 17. What are the required minimum TOEFL/IELTS scores for graduate programs? MS & PhD: Although required for admission, all complete applications receive a full review regardless of the TOEFL/IELTS scores submitted. Visit USC Graduate Admission’s English Proficiency page for detailed information about TOEFL/IELTS requirements. 18. 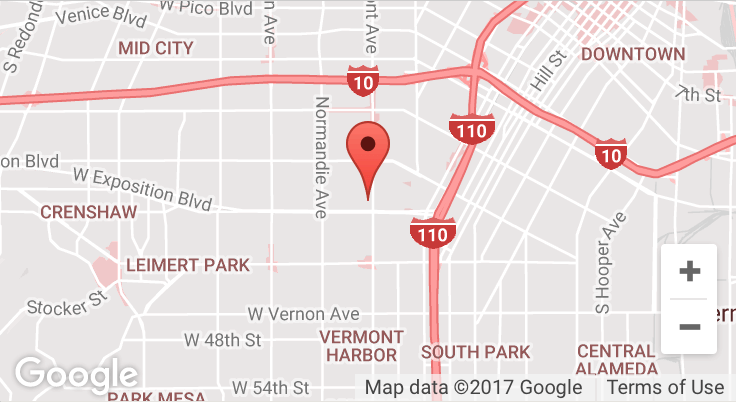 How do I submit my TOEFL scores to USC? MS & PhD: TOEFL scores must be submitted electronically from the ETS website to “U Southern Cal,” ETS code 4852. You do not need to provide a department code. However, if the ETS system requires one, just select the one that is the best fit. All TOEFL scores are automatically sent to our Graduate and International Admission Office, so it doesn’t matter what department you select. Valid TOEFL scores must be dated within two years of the start of the intended application semester. The Fall semester starts in August, and the Spring semester starts in January. 19. How do I submit my IELTS scores to USC? MS & PhD: Valid IELTS scores must be sent electronically to USC. USC does not accept valid IELTS score by postal mail. To submit your IELTS results to USC, please select the “University of Southern California” from the list of available institutions when you register to take the IELTS test. Do not enter the name, contact information or mailing address of the specific USC department to which you are applying on your IELTS registration. You may also request that your IELTS results be sent to USC after you receive your scores by contacting the test center where you took the test and request that your results be sent to the University of Southern California electronically, not by postal mail. You can search for contact details for all IELTS test centers at www.ielts.org/testcentres. Valid IELTS scores must be dated within two years of the start of the intended application semester. The Fall semester starts in August, and the Spring semester starts in January. 01. What is current tuition? MS & PhD: Visit our Tuition page for current tuition information. 02. How do I apply for financial aid and loans? MS: Visit the USC Student Financial Aid pages for information. PhD: USC tries to fully fund all of its doctoral students, so there is no need to apply separately for funding. 03. How do I apply for USC Viterbi scholarships? MS: The Viterbi School is pleased to offer merit-based funding opportunities to U.S. and International students applying for Master’s programs. In order to be considered for funding, you must submit the online Graduate Application for Admission and your official transcripts by December 15 for the Fall semester or August 31 for the Spring semester. All other application and supplemental materials required for the program(s) to which you are applying, such as GRE and TOEFL scores, must be submitted by the application deadline of January 15 for the Fall semester and September 15 for the Spring semester. PhD: Doctoral applicants do not apply for Viterbi scholarships. 04. When will I know if I have received a Viterbi Scholarship? MS: Scholarship decisions are separate from Admission decisions. Fall scholarship recipients will be notified via email by May 1st and Spring recipients by November 1st. PhD: This does not apply to doctoral applicants. 05. How do I apply for research/teaching assistantships? MS: Research/teaching assistantships are reserved for our PhD students and are not available to Master’s students. PhD: Doctoral applicants are automatically considered for research/teaching assistantships. A separate application is not needed. 01. What is the deadline for submitting the Statement of Intent? MS: The deadline to submit the Statement of Intent is May 1 for Fall admission and November 15 for Spring. PhD: The Fall deadline to submit the Statement of Intent is April 15. 02. Is there a commitment deposit and how do I pay it? MS: Yes, the non-refundable commitment deposit is $500. The deposit goes toward your tuition once you enroll. PhD: There is no commitment deposit for doctoral students. 03. I have decided to enroll at USC. Where can I find information on orientation and next steps for new students? MS & PhD: Please visit our Newly Admitted Students page for orientation dates and a checklist of next steps. 04. Can I change my program after I have been admitted? MS & PhD: In order to change programs, you will need to complete your first semester in the program to which you have been admitted. After completing that semester you may request to transfer to another program. Your request will be reviewed by the department to which you are requesting transfer and they will make a decision on the request. Requests for a change of program are not automatically approved and may be denied. 05. Can I defer my admission to another semester? 06. How do I submit the Statement of Intent? 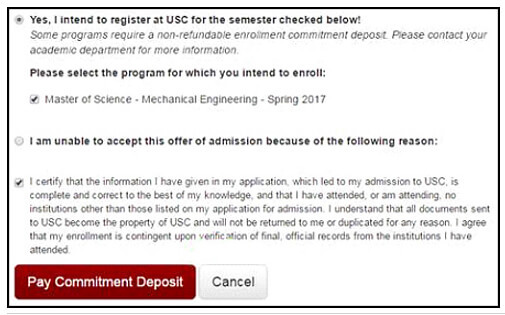 MS & PhD: Click on the Statement of Intent button once you log into you.usc.edu. Submitting the Statement of Intent form will allow you to create your university email account, register for Graduate Student Orientation, and access your USC records. Note: Even if you opt not to attend USC, we ask that you submit the Statement of Intent. 07. If I was not admitted for a previous semester, can I reapply? 2) If you were denied admission and choose to reapply, it is in your best interest to submit new and compelling academic information that was not part of your original application, such as updated transcripts and/or test scores. You will need to submit a new application and pay another application fee. (On the application, make sure to indicate that you have applied before and input your USC ID number when prompted.) You can send an email to our Viterbi Graduate Admissions Office to check on whether you will need to re-submit transcripts and test scores. (Make sure to include your USC ID number in the email.) Any materials that have changed since their original application (including updated transcripts, test scores need to be submitted by the application deadline for the new semester to which you are applying. Note: It is recommended that PhD applicants try contacting faculty before submitting a new application. 08. Can you provide me with a reason if I was not admitted to a program? MS & PhD: As there was a comprehensive review of your entire application, we are unable to offer specific reasons for your denial. The faculty has set parameters for admission based on GRE scores, overall academic performance, and major-specific academic performance, and unfortunately we did not feel it was possible to make an offer of admission at this time. 09. What is the deadline for submitting financial documentation? MS: We strongly recommend that financial documentation be submitted no later than April 15. 10. When will I receive my I-20? MS: I-20 papers are generally issued within a week of when the Statement of Intent has been submitted. Note: Financial documentation needs to be submitted before the Statement of Intent becomes available in the you.usc.edu portal. PhD: I-20 papers are generally issued within a week of when the Statement of Intent has been submitted. 11. How (and when) do I complete Degree Verification? MS & PhD: Degree verification through IERF needs to be submitted before the end of the student’s first semester and can be done after arriving at USC. More information can be found on the Degree Progress pages.